Sometimes I think I should have a series in my blog for funny condominium project names here in Bangkok. I see advertisements for them from time to time and wonder how a particular name was chosen. And the name “Rende”? Did they name the condo after the city of Rende, Italy? If so, why? Rende does have two museums, but neither is particularly noteworthy. Maybe the developers named the condo after the city because the city has the largest mall in southern Italy. Or maybe they named the condo after the Dutch word “rende,” which means “trough,” “furrow,” or “ditch.” That doesn’t sound very likely, either. 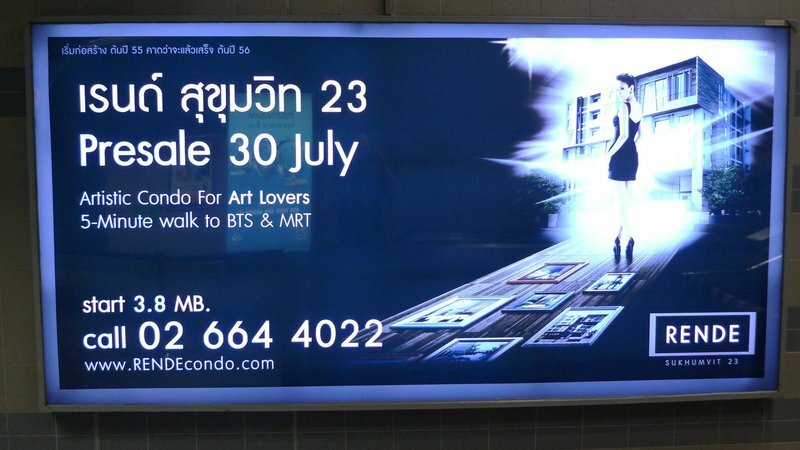 This entry was posted in Uncategorized and tagged condo, culture, Names, Rende, thai, Thailand by christao408. Bookmark the permalink. hmmmmmmmmm, how people names things is an interesting topic. Why don’t you just ask the developers? heh! Probably makes more sense in Thai. @Inciteful – Actually, I had thought about that but the Thai name is only a transliteration of the English name. Doesn’t have any inherent meaning. Only you would think of writing something like this and making all of us wonder why we didn’t post an interesting topic like this ourselves! People just want to be innovative and the more different a name sounds to the local group, the better for marketing I suppose. @ZSA_MD – That is probably exactly the case – the names “sound good” to Thais, even if they make no sense in the original language.